A man kills a prospective buyer for his car. On the verge of becoming a name in the interior design world, he can't afford a scandal and must discreetly dispose of the body-- not an easy job when the whole of London seems to be conspiring against him. 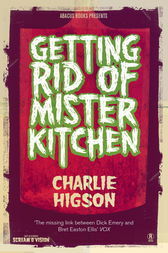 Charles Higson is writer, producer and performer on the hit BBC comedy THE FAST SHOW. He has also worked as a writer for Harry Enfield and a producer for Reeves and Mortimer as well as being the singer in a band, The Higsons, in the early eighties.